We've found that it's difficult to find free bird feeder plans all in one place, so we've searched the net and did it for you as well as include our own plans for a hopper feeder. Enjoy! Choose the feeder that fits best with the kind of birds you wish to attract. Remember to use squirrel baffles when mounting feeders on poles as well as from above. Hopper bird feeders will attract a wide variety of birds, from chickadees to jays. 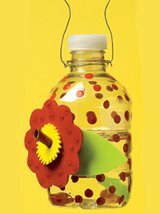 It is an excellent feeder for black oil sunflower seeds. This type of feeder is self-refilling, letting out a small quantity of seed at a time as the birds eat. The hopper has walls and a roof, to keep the seed dry, and small openings at the bottom, where a small portion of the seed can spill out from the main container onto a tray. 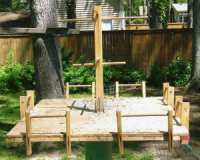 Here are Free Bird Feeder Plans for the pictured hopper-style, wooden bird feeder on the left with detailed instructions. We built this feeder years ago and never had any problems with it and most importantly, the birds love it! 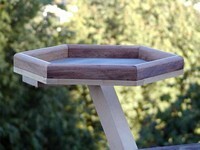 Below is a quick overview of building a hopper bird feeder from wood with plexi-glass windows. Platform bird feeders will attract the widest variety of birds because it's basically an open tray that doesn't restrict birds, big or small, from eating. 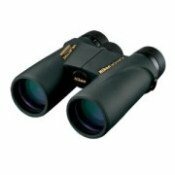 This can be a pro and a con at the same time depending on the types of birds in your neighborhood. For example, if starlings, blackbirds, pigeons, etc. 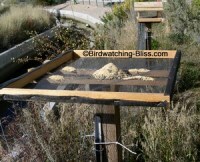 take over your feeder and keep out the smaller songbirds, you may not necessarily want to put up this type of feeder. Click on photos for platform feeder plans. A nice addition to the basic design would be a roof or canopy to keep seeds dry. There should also be enough drainage holes to prevent water accumulation and subsequent mold and mildew growth. Here are platform bird feeders for sale. 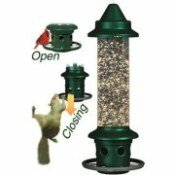 Tube bird feeders are cylindrical tubes that cater to smaller birds with its multiple feeding stations and smaller perches. If you remove the perches, you can restrict the feeder to only those birds that can easily cling - finches, chickadees, titmice and woodpeckers. Or if you prefer more variety, bottom trays attached to the tube will allow larger birds to land and feed. It is excellent feeder for black oil sunflower seeds and special variation can have tiny seed ports for thistle feeding. 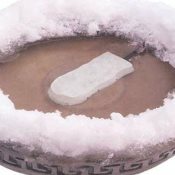 Suet is a high energy food made from animal fat. Suet feeders are mesh containers which hold suet blocks and allows "clinging" birds to feed through holes. They will attract woodpeckers, chickadees, nuthatches, kinglets, cardinals, and creepers. If starlings are a problem at your suet feeder, discourage them by using a suet feeder with access only from the bottom. Starlings are reluctant to perch upside down. Chickadees and woodpeckers don't find that to be a problem. Hummingbird feeders are a real favorite for attracting the color, speed, and aerial acrobatics of this small but fascinating bird. They are inverted containers filled with nectar, or sugar water, that is dispensed through tiny holes. Construct feeders that are easy to clean because mold & fermentation will occur inside the feeder as quickly as 3-4 days. 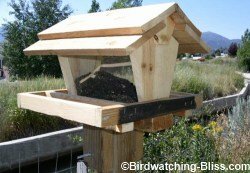 For nearly no expense, you can build feeders from items found in or outside your house! 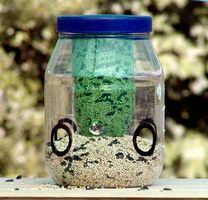 Below is a video demonstration to build a simple feeder. Hope you've enjoyed this page of bird feeder plans and we wish you all the best in attracting lots of birds with your new feeder! If possible, try to place your feeder where squirrels cannot access them from above or where they are unable to jump to them...otherwise, without protection, you've just built a squirrel feeder as well! And be sure to install a squirrel baffle either above or below your bird feeders depending upon if they are hung from a branch or mounted on a pole. If you are finding it too difficult to keep away the squirrels from your bird feeders, here are some free squirrel feeder plans to make everyone happy! Fed separately, but equally sometimes will solve the problem. Bird Feeders - Best bird feeders by type.